Analysis: The Texas product was only able to suit up in five games last season, catching six of his eight targets for 102 yards and a touchdown. Johnson also underwent ankle surgery at the end of 2018 but was medically cleared to participate in offseason workouts on Feb. 26. The Colts extended a tender to Johnson on Friday, Stephen Holder of The Athletic reports. Analysis: The Texas product was only able to suit up in five games last season, and caught six of eight targets for 102 yards and a touchdown. It should be noted that Johnson received medical clearance following ankle surgery, so he should be a full-go this offseason. Johnson (ankle) announced via Twitter he received medical clearance from ankle surgery he underwent in October. Analysis: Johnson tore a ligament in his right ankle Week 6 against the Jets and subsequently underwent surgery. The 24-year-old had six catches for 102 yards and a touchdown in five games last season and is set to to be an exclusive rights free agent with the Colts. Johnson, who was placed on injured reserve Tuesday, will undergo surgery on a torn ligament in his right ankle, Joel A. Erickson of The Indianapolis Star reports. 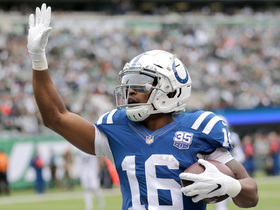 Analysis: Johnson's role steadily increased in the Colts' passing attack as injuries piled up within the receiving corps, culminating with his first career touchdown Sunday against the Jets. During that contest, though, he suffered a serious ankle injury that may end his season. To account for the lingering injuries to T.Y. Hilton (hamstring), Ryan Grant (ankle) and Jack Doyle (hip), the Colts signed veteran wide receiver Dontrelle Inman on Tuesday. Johnson (ankle) was placed on injured reserve Tuesday, Adam Caplan of SiriusXM Radio reports. Analysis: It's another injury for the Colts wide receiver unit. Ryan Grant (ankle) was also forced out of Sunday's loss to the Jets. With T.Y. Hilton still nursing a hamstring injury, Indianapolis is dealing with serious depth issues at wide receiver. Now that Johnson's season is likely over, the Colts elected to bring in free agent Dontrelle Inman on Tuesday, which should give them much-needed stability at the position given his four years of NFL experience, most of which came with the Chargers. Johnson suffered an ankle injury during Sunday's loss to the Jets, Kevin Bowen of 1070 The Fan reports. Analysis: Johnson had his best game of the season Sunday, catching two balls for 52 yards and his first NFL touchdown. Both he and Ryan Grant (ankle) left the game early. Those injuries, coupled with T.Y. Hilton's ongoing hamstring injury, leave the Colts thin at wide receiver. Johnson had two receptions on three targets for 52 yards, including a 34-yard touchdown, in Sunday's loss at the Jets. 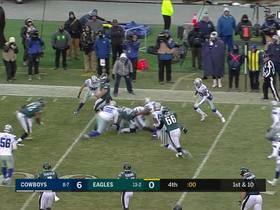 Analysis: Johnson played 34 of the offense's 69 snaps, getting more playing time when Ryan Grant left with an ankle injury. Johnson is fourth on the depth chart, but could get more playing time next week if T.Y. Hilton (hamstring) remains out and Grant is also sidelined. Johnson had two receptions for 26 yards on two targets in Thursday's loss at New England. Analysis: Both of Johnson's receptions came late in the fourth quarter after Zach Pascal struggled. The Colts may have used him anyway as they were behind in in passing situations, but Johnson has a chance to pass Pascal on the depth chart. Johnson had two catches for 24 yards on three targets in Sunday's loss to Houston. Analysis: Johnson was pressed into action when T.Y. Hilton went down with a hamstring injury and played 19 snaps on offense, after playing just seven total in the first four games. However, he had a key drop on a third-down play, which could limit his usage next week if Hilton remains sidelined. Johnson lost two yards on one carry in Sunday's loss at Philadelphia. Analysis: Johnson played just two snaps on offense and has logged just seven snaps from scrimmage overall this season. This was a rare touch for him on offense, as he's usually relegated to the bench. Johnson is a healthy inactive for Sunday's game against the Bengals. Analysis: Johnson's absence will leave just four active wide receivers for the Colts. The 24-year-old may not have been ready for action right away, however, as he was traded to the Colts just eight days ago and may not fully know the playbook yet. 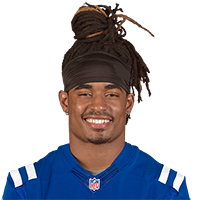 Johnson was traded to the Colts on Saturday in exchange for tight end Darrell Daniels, Mike Chappell of Fox 59 News Indianapolis reports. Analysis: Traded from Philadelphia to Seattle in the offseason, Johnson found himself on the roster bubble with the Seahawks. He could conceivably work his way up to fourth or fifth on the wideout depth chart in Indianapolis, where injuries and a general lack of talent give him a real chance to stick around this season. Johnson recently dealt with a hip injury, but he made it back to play 14 snaps in Seattle's preseason finale against Oakland. Johnson is nursing a hip injury and isn't certain to be available for Thursday's preseason game against the Raiders. Analysis: Johnson reportedly sustained a minor hip pointer after making a falling catch in practice this week. Even if he isn't available to play Thursday, there doesn't seem to be any concern over his availability for Week 1. Johnson will be traded to the Seahawks along with a fifth-round draft pick in exchange for defensive end Michael Bennett and a seventh-round pick, Adam Schefter of ESPN reports. Indianapolis Colts wide receiver Marcus Johnson hauls in a 34-yard pass from quarterback Andrew Luck for his first NFL touchdown. 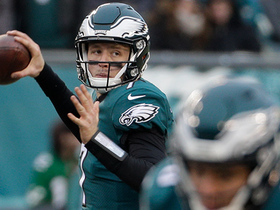 Philadelphia Eagles quarterback Nate Sudfeld shows great touch on a 16-yard pass to Marcus Johnson.